The sign said it was on sale for $2.97. Next to it was a rack of TI-83’s for ten million, I mean $125.00. One could buy an entire class set of these Staples things and still have like thirty dollars left over, instead of buying a single TI-83. So I decided to conduct a three-dollar experiment. Can this thing actually do everything one would need to get through the BC pre-calculus stream? First thing I notice when I turn it on, in the parking lot before I drive away: the screen is glitching out. I go back in, swap it for another, okay this one seems fine. Well, that didn’t last either, as you’ll see in the rest of the photos. I have no idea if this is indicative of all of these calcs, or if this was a batch of return-for-refund (which some of them looked to be) and that’s why they were on sale, or if I just had a bad stroke of luck, or if they act weird when the batteries are low. Speaking of which! 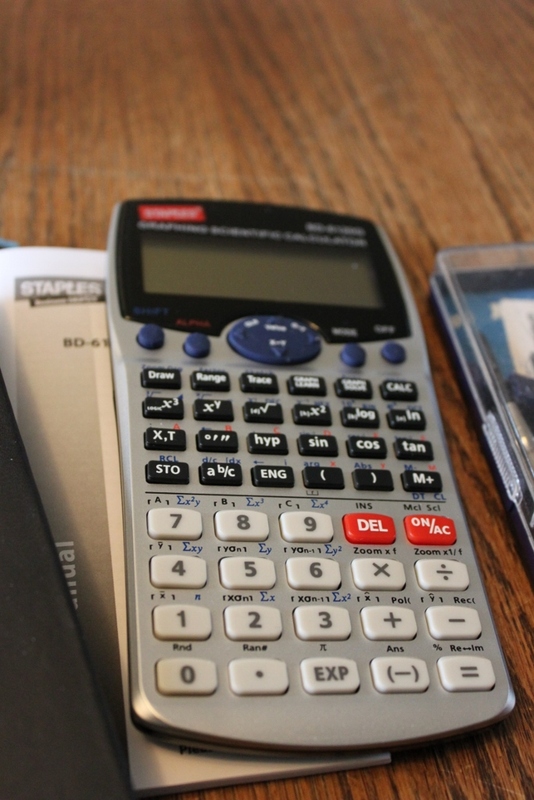 They use annoying large watch batteries, the ones that run out faster and cost more money to replace than this calculator did in the first place! So points against for the cheapo build and annoying battery choice. The display itself is kind of a hybrid of normal scientific calculator LCD, and a full pixel-grid graphing calc display. There’s one section on the left where graphs appear, a row along the bottom where text appears, and some other bits on the top right for random other LCD symbols or whatever. Assuming you get one of these with a working display, this is the important part. Can it actually do everything you need it to do? The short answer is, yes, except for one small thing, but it also does one new thing I’ve never seen in a graphing calc that’s kind of awesome. 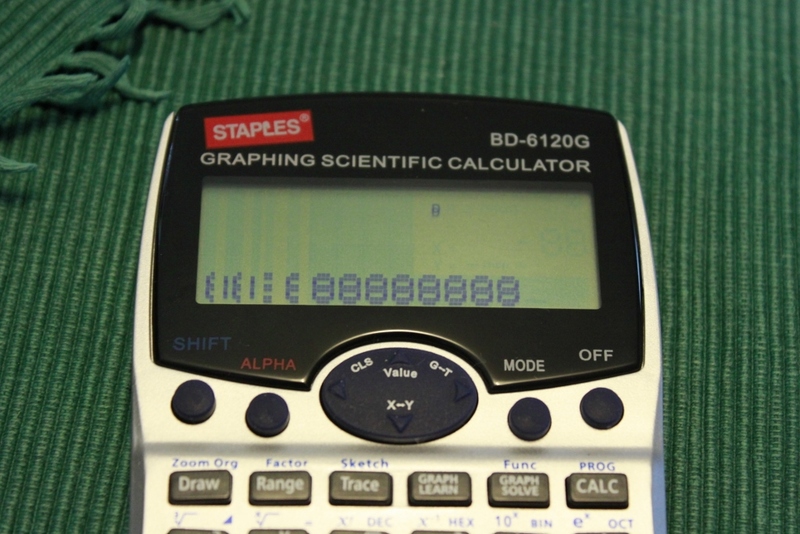 All the stuff you’d expect from a scientific calculator is here. Trig, inverse trig, exponents, a fraction button (that kids never seem to clue into the existence of unless you spell it out to them), logs, etc. It seems to be able to do a couple of different kinds of storing numbers into memory, if you’re into that kind of thing. Apparently it can also do numerical integration. So we’re entering “could complete high school calculus with this thing maybe” territory. Now the meat of the question: does it really do graphing properly? Pretty much, yeah. You can’t graph as many simultaneous functions, but you can do two at a time. The screen is a bit smaller than a TI-83’s but let’s face it, we’re comparing low-res to low-res and they both do the job about as lousy as the other. Also sometimes it seems to forget to erase the previously graphed function. There’s a graphical solver that is a separate button from the normal ‘Draw’ button, but which lets you enter whatever function and whatever you want to test for y being equal to. 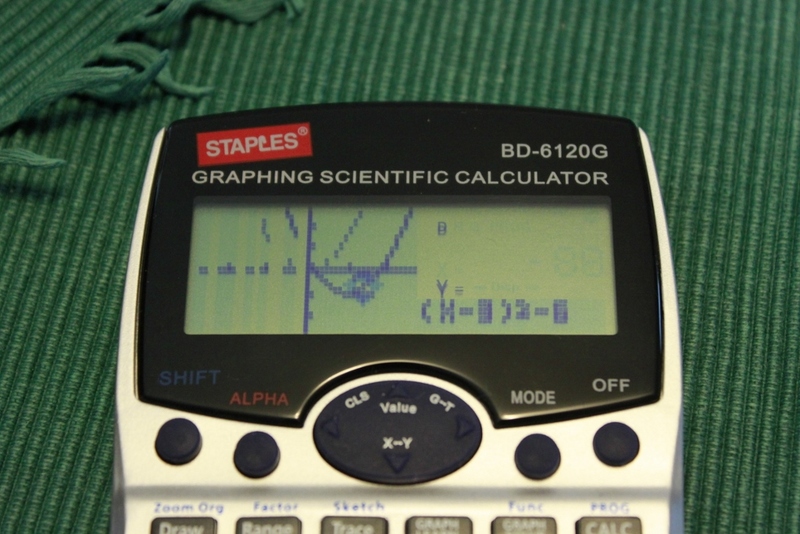 In fact it’s sort of less annoying than the TI-83 since you don’t need to choose left and right bounds. It just finds all the solutions it can on-screen. There’s some additional ‘sketch’ functionality that lets you do things like draw lines between two points, or more interestingly draw a tangent to a given function at a chosen point. The only thing this is missing: you can’t find local max/min of a function such as a quadratic. You can zoom in on the vertex and trace it manually until you’re close enough, I suppose, but it’d be a bit of a pain. 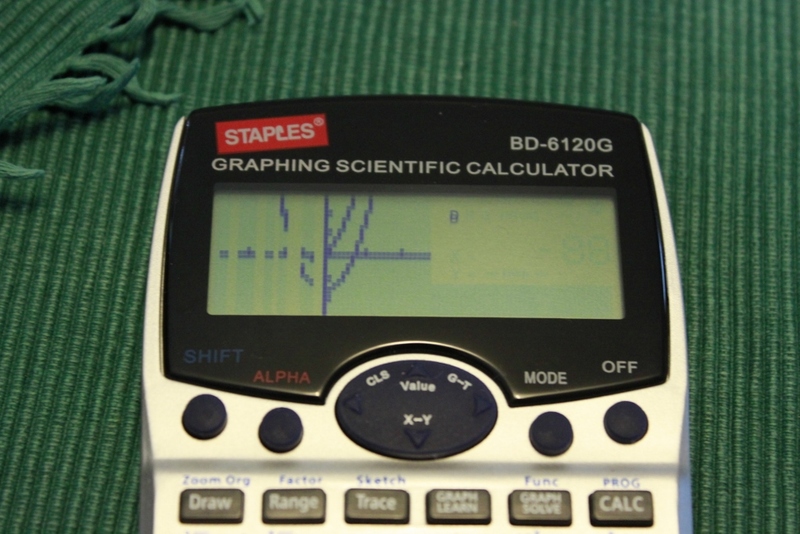 The calculator has a ‘GRAPH LEARN’ button that was bewildering at first, until I read what was going on. This thing is letting you explore function transformations visually. You can choose one of a bunch of standard functions, such as x^2, square root of x, ln x, sin x, etc. You pick whether you want to try “shift”, ie. translations, or “change”, ie. expansion / compression. Then it graphs that function for you and you can alter the graph using the arrow keys. As you move or change the function, it shows the updated function definition beside the graph. So kids could practice moving a function around and seeing how it affects the equation for that function. If I had my own class, which I don’t, and if I could get my hands on a whole set with working screens, which might be challenging, I would totally be happy with a class set of these things. Not being able to find the vertex of a quadratic is a small disappointment, but the fact that it manages everything else for such a low price is crazy worth it. Also keep in mind, I’m primarily thinking of BC’s PreCalc 11 and PreCalc 12 here. We don’t have provincial exams. If you decide to adopt this calc for your entire class, you can just assess the “with technology” version of everything that this calculator can do, and leave the “find a min/max” for problems done algebraically. Or with Desmos on something that’s not an exam. It does make me wonder a lot harder about the other alternatives out there, though. I’ve seen kids use Casio graphing calculators that are less than half the price of a TI. If someone wants to send/loan me one maybe I’ll test out one of those next time. A lot of teachers wonder why we even use TI’s when there are free apps like Desmos, Geogebra, and Wolfram Alpha out there. I think that’s ignoring the unfortunate pressure of needing to have something that works during exams, and that it’s an extra pain to lock down iWhatevers from messaging during classroom tests. But there’s no reason we need to keep handing TI a monopoly over the market. This Staples cheapo is an extreme example of something low-balling and still managing to pretty much get the job done. It might be too cheapo, but it should still serve as a wakeup call. There’s no reason why we math teachers can’t support our students by doing the due diligence to test out and recommend alternatives to the TI regime.